The Christiane Chronicles: Some people watch ballet. I admire the Dance of the Short-Order Cook. Some people have season tickets to the ballet; others follow sports. The spectacle I’m addicted to, every bit as physical in its own way but more quotidian, is the artistry of the short-order cook. I have heard the argument that a person can learn to be a chef but must be born a short-order cook. 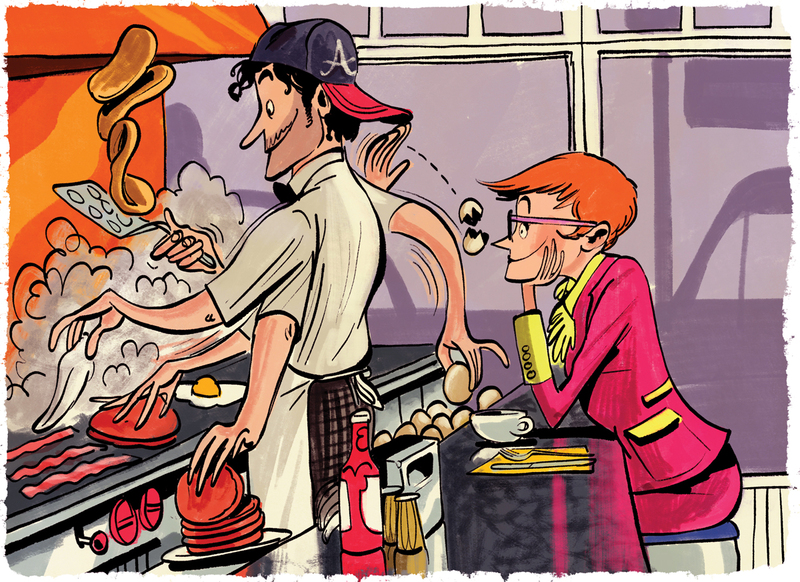 Flipping eggs and burgers on a hot surface is a noble, underappreciated job that requires finesse and impeccable timing. A short-order cook must be capable of the tight, agile footwork required to feed the masses while moving as little as possible from one’s station between the grill and the fryer. Other than fast-food chains, there are not many places left in Atlanta to observe short-order cooks practicing their art on a large metal plate with the help of various scrapers, spatulas, and bacon presses. Gato in Candler Park is one of my favorite spots to hop a stool and watch a cook (in this case, owner Nicholas Stinson) crack eggs, warm up tortillas, dump pancake batter, and sizzle bacon—all seemingly at the same time. Gather, the restaurant corner inside the new Grant Park Market, has two flat-top grills and a fryer behind its long counter. A lightning-fast team slams burgers, frizzles cheesesteaks, and grills cheese sandwiches oozing with goodness. Their best trick? Placing a small metal bowl over their cheeseburgers toward the end of cooking to trap moisture inside the meat and speed the melting of the cheese. I’d trade many of the high-end restaurants in town for a dozen unironic diners where I could watch food—without the drama—taking shape in front of me. 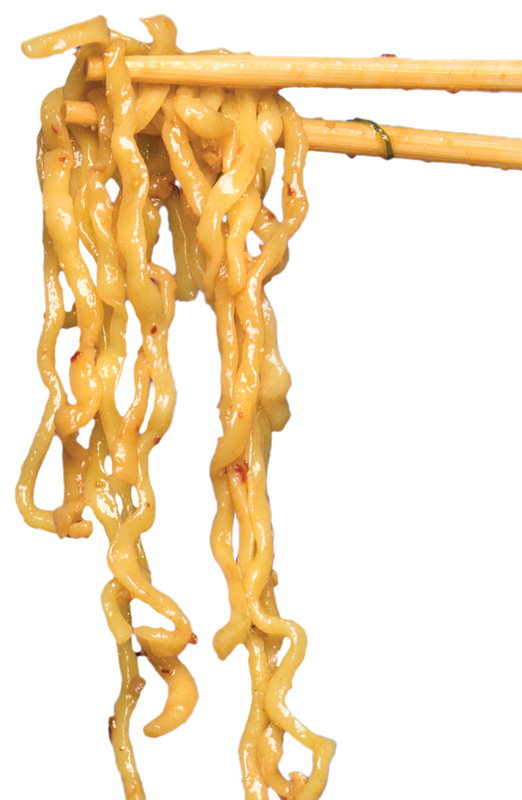 Are these really the right chopsticks for handling noodles? It may not be one of life’s great tragedies, but when I take people to eat at an Asian restaurant and they ask (often sheepishly) for a fork, I experience a burning shame. I feel sorry for them, uncomfortably aware that one can’t experience a cuisine without using the proper tools. Imagine attacking a hamburger in public with a fork and knife. Disposable chopsticks get bad press because of their environmental impact (think of the millions of trees sacrificed) and manufacturing conditions (often slave labor using toxic chemicals). Yet they’re easier to use than their slipperier counterparts made of polished wood, plastic, or metal. Practice with them at home until you can pick up a single noodle or grain of rice. Not all chopsticks are the same. Chinese ones tend to be blunt, made for shoveling in rice from a bowl held just below the chin. Japanese ones are pointier precision instruments for dealing with razor-thin slices of raw fish or tangles of thin noodles. Korean chopsticks are flatter, made of metal, and often used in conjunction with a spoon. I don’t approve of Chinese restaurants using Japanese chopsticks or vice versa. I recently enjoyed a meal at Donna Chang’s in Athens, which serves updated versions of General Tso’s chicken and pork wontons—and hands out elegant but inefficient Japanese-style pointy chopsticks. This article appears in our April 2018 issue. Atlanta doesn’t have a Chinatown or a Little Ethiopia. That’s (mostly) a good thing.